It’s going back a few years to when the Echills Wood Railway re-opened. You can see how the page looks, with a brief description about the visit, along with links to the photos and to the EWR web site. I’m pleased with how it looks, and it’s much easier than updating the old style html site. This entry was posted in Photo Galleries on February 28, 2011 by Sharpo. It seems to be going well at the moment. Getting the basic format right from the start is important, then making sure it is easy to use for the largest number of visitors. Both of the above links go to the home page, the lower one is the direct link, but the top one is set to divert to it. Plugins have been added for a contact form, also to make the right-hand menu expand & collapse, depending on which section visitors are looking at. The mobile plugin seems to work for my cheap ‘phone and the latest plugin is to add tags to pages for the benefit of search engines. I know it’s going to take a long time to work through all my albums, but hopefully it should be worth it. Surprising how many photos I’ve forgotten about as I work through the albums! This entry was posted in Computers on February 28, 2011 by Sharpo. Yes, I’m aware of missing photo captions & all that sort of thing in the galleries, but something that has been bugging me for ages is the state of the old html sites that link to/from the gallery albums. They were never properly fixed after the hacking incident some years ago, and probably before then many of the links did not work. So, I spent an evening trying to understand how Joomla works. I installed it with sample sites, but didn’t find any templates I was happy with. Then I couldn’t understand how to build my own site, so decided to stay with WordPress. Rather than mess around with this blog I decided to start another installation of WordPress and base it on pages, rather than blog “posts”. The new site will act as an index to all the gallery albums, along with a few details about the photos in the album. Many hours have been spent “experimenting” but I think I have a format that will work. At least it will be easier than updating the old style html sites and I can even do the work on any pc – not just the one on which the web site software was installed. I have also installed a “plugin” which should make it easier to access with a mobile ‘phone. To make the pages download faster there will not be any images, as there are plenty of those in this blog and the galleries. I have included a link to Vidahost, as I’m pleased with their hosting services! You will notice I have another domain name to use – it made it easier for me whan I changed hosts. Finally, as it has only just been started, only 3 proper links so far – to the first 3 miniature railway albums, but at least you can see how it looks. This entry was posted in Computers, Uncategorized on February 27, 2011 by Sharpo. When I was looking for a new host I looked through the sites for the well-known names, not really happy with what they offered, so tried a few new names. A couple looked fine, but looking in greater detail – still no good. E-mailed another host to check a few things, but still no good. Finally, came across Vidahost after many hours looking through forums & reviews. A couple of e-mails to their support & the decision was made. So I’m now with Vidahost. Pages are downloading much faster and hopefully my regular visitors will notice the difference! So, if you need a host for your site, there’s one I can recommend – click on the link above. This entry was posted in Computers on February 23, 2011 by Sharpo. I think all files are now uploaded. Just some e-mail accounts to set up & a final check before altering DNS settings, probably later today. Then just a matter of waiting for the links to be directed to the new host. This entry was posted in Computers on February 22, 2011 by Sharpo. One of my other domains has already been moved – this includes my test gallery. I’m pleased to say the photos in that gallery download much faster, so am looking forward to having the other galleries moved soon. Just about everything has been uploaded – over 5GB of data and something like 100,000 files! Only one more gallery to check, then the smaller jobs like this blog & my e-mail accounts. After that, alter some DNS settings and wait for the change to take place. Hopefully this will be done in a few days time. This entry was posted in Computers on February 20, 2011 by Sharpo. The previous week I saw a DBS loco working the scrap train to Cardiff, which reminds me I’ve done nothing with those photos yet ( but it was extremely dull, so poor results) so a change to GBRf adds some interest to the working. Over the years the scrap train to Cardiff has proved very difficult for me to see, running early, late or via the Lickey. There is no advance warning as it starts from just a few miles away from here & looking for “sightings” is pointless. There is a little write-up to go with the photos, explaining things didn’t go to plan, and my nightmare journey home. This entry was posted in Sharpo's World Photo Updates on February 16, 2011 by Sharpo. 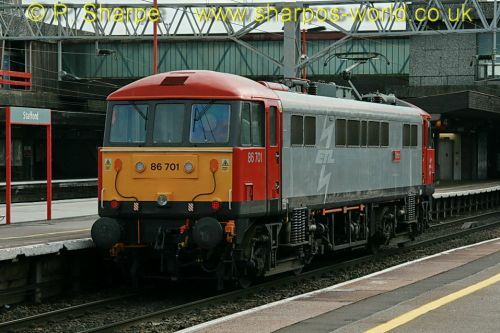 86701 was being used on training runs from Crewe, and was due to run to Stafford all week. So a few hours up there seemed a worthwhile few hours out. There were a few other locos seen during the time there, but 70010 was not expected, so that was a pleasant surprise. The other bonus was the 37s on the Bridgwater to Crewe 6M67 working. A pair of Class 379 EMUs on test between Crewe & Northampton were also seen several times, the units were 379001 & 379005. Lots of head-scratching & internet searches, but I signed up with a new host a few days ago & have been busy transferring files. Still using the old host at the moment, but testing one of the galleries that I have started installing with the new host and the images load much faster. Will keep you informed about when the changeover is likely to happen, but you’ll probably notice the increase in speed after it has happened. This entry was posted in Computers on February 16, 2011 by Sharpo. An Arriva Trains Wales Club55 offer was tempting me to have a day trip to Wales. Checking train times, I found it was possible to get to Porthmadog for a 10 mile round trip on the new section of the Welsh Highland Railway from Porthmadog. Our first sighting of Taliesin was as our Arriva train crossed the narrow gauge line, it was waiting to cross the standard gauge track to head for the Ffestiniog Railway station. Walking down to the FR station, there was an opportunity for a few photos before the diesel hauled the train onto the Cob, where it was uncoupled and Taliesin hauled our train across the road on the new section of the WHR. After our journey and back at Porthmadog a few more photos before the long journey home. 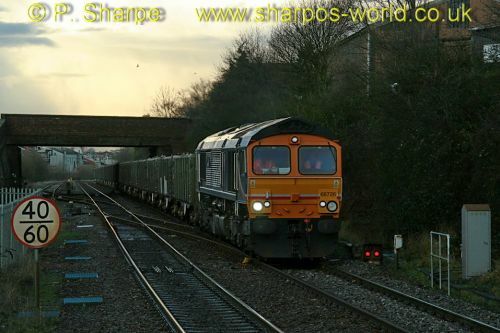 This entry was posted in Sharpo's World Photo Updates on February 5, 2011 by Sharpo. The Class 20s ran from Gloucester to Small Heath & return on route learning duties. I was able to see them at Old Hill on the outbound journey and then at Cradley Heath on the return. 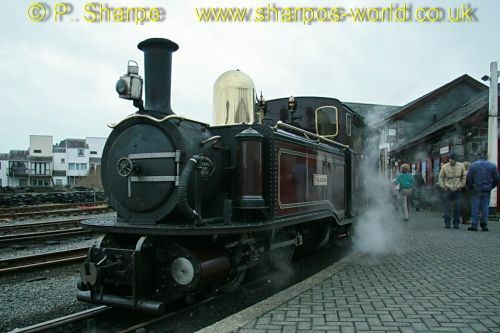 This entry was posted in Sharpo's World Photo Updates on February 1, 2011 by Sharpo.